Hereditary is a 2018 American horror film written and directed by Ari Aster, in his feature directorial debut. It stars Toni Collette, Alex Wolff, Milly Shapiro and Gabriel Byrne as a family haunted after the death of their secretive grandmother. 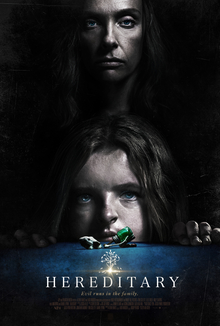 Hereditary premiered on January 21, 2018, in the Midnight section at the 2018 Sundance Film Festival, and was theatrically released in the United States on June 8, 2018. It was acclaimed by critics, with Collette's performance receiving particular praise, and was a commercial success, making over $79 million on a $9 million budget to become A24's highest-grossing film worldwide. Annie Graham (Collette) is a miniatures artist who lives in Utah with her husband, Steve (Byrne); their 16-year-old son, Peter (Wolff); and their eccentric and reserved 13-year-old daughter, Charlie (Shapiro). At the funeral of her secretive mother, Ellen Leigh, Annie delivers a eulogy explaining their fraught relationship and her mother's extremely private life. A week after, Steve is informed that Ellen's grave has been desecrated, while Annie thinks she sees an apparition of Ellen in her workshop. At a support group for the bereaved, Annie reveals that the rest of her family suffered from mental illness that resulted in their deaths, and how Ellen was a significant figure in raising Charlie. To attend a party, Peter lies that he is going to a school event, and Annie forces him to take Charlie with him. Unsupervised, Charlie eats cake containing nuts, which she is allergic to, and falls into anaphylactic shock. As Peter drives her to a hospital, Charlie leans out of the window for air. Peter swerves to avoid a dead deer and Charlie is decapitated by a telephone pole. In shock, Peter silently drives home and leaves his sister's corpse in the car for their mother to discover the next morning. The family grieves following Charlie's funeral, heightening tensions between Annie and Peter and causing Annie to behave coldly towards Steve. Peter is plagued by Charlie's presence around the house. Annie is befriended by a support group member, Joan. Annie tells her she used to sleepwalk and recounts an incident in which she woke up in Peter's bedroom to find herself, Peter, and Charlie covered in paint thinner with a lit match in her hand. Joan teaches Annie to perform a séance to communicate with Charlie. Annie wakes from a nightmare and convinces her family to attempt the séance. Objects begin to move and break, terrifying Peter, and Charlie seemingly possesses Annie until Steve douses her with water. Annie suspects that Charlie's spirit has become malevolent. She throws Charlie's sketchbook into the fireplace, but her sleeve also begins to burn, showing that she is connected with it. She retrieves it and heads to Joan's apartment for advice, but Joan is nowhere to be found. Annie notices that Joan's welcome mat resembles her mother's craftwork. She goes through her mother's possessions and finds a photo album linking Joan to Ellen, and a book with information about a demon named Paimon, who wishes to inhabit the body of a male host. In the attic, Annie finds Ellen's decapitated body with strange symbols on the wall written in blood. At school, Peter becomes possessed and slams his head against his desk, breaking his nose. Annie shows Steve her mother's body and the sketchbook. Annie begs Steve to burn the sketchbook so she can sacrifice herself to stop the haunting, but Steve assumes she has gone mad, accusing her of desecrating Ellen's grave herself. When Annie throws the book into the fireplace, Steve bursts into flames instead. Peter awakens to find his father's body. A possessed Annie chases him into the attic, which is decorated with occult imagery. Levitating, Annie beheads herself with a piano wire as naked coven members look on. Peter jumps out of the window. As he lies on the ground, a light enters his body and he wakes up. He follows Annie's levitating corpse into Charlie's treehouse, where Charlie's crowned, severed head rests atop a mannequin. Joan, other coven members and the headless corpses of his mother and grandmother bow to him. Joan, addressing him as Charlie, swears an oath to him as Paimon, stating that he has been liberated from his female host, Charlie, and is free to rule over them. Toni Collette as Annie Graham, a miniaturist artist. Gabriel Byrne as Steve Graham, Annie's psychiatrist husband. Alex Wolff as Peter Graham, Annie's and Steve's 16-year-old son. Milly Shapiro as Charlie Graham, Annie's and Steve's 13-year-old daughter. Ann Dowd as Joan, a support group member who befriends Annie. Mallory Bechtel as Bridget, Peter's schoolmate, and love interest. The actress who portrays Annie's mother Ellen Taper Leigh is uncredited, and her name has not been disclosed. Aster referred to her as "the sweetest person in the world". Writer-director Ari Aster, the creator of the screenplay for Hereditary, embarked on a career in the film industry while a student at the American Film Institute; he scripted and directed two provocative short films The Strange Thing About the Johnsons and Munchausen, bringing him under the scope of A24. Aster originally pitched Hereditary as a family tragedy before emending his script into a supernatural horror film in hopes of enticing distributors. A fan of domestic dramas, Aster incorporated themes of the genre into his script, envisioning a film rooted in family dynamics, trauma, and grief; Carrie and The Cook, the Thief, His Wife and Her Lover were works Aster specified as influences on Hereditary. He interpreted the film as two halves which are "completely inextricable from each other": "It begins as a family tragedy and then continues down that path, but gradually curdles into a full-bore nightmare". Toni Collette was one of the first actresses Aster sought for the role of Annie Graham, a miniaturist and the matriarch of the Graham family. Though Collette was reluctant to work on a horror film, the script's grounded approach to the genre convinced her to commit to the project: "He [Aster] just really understood the dynamics in the family, has such an understanding of what it is to be human, what it is to experience loss". Gabriel Byrne agreed to play the family's patriarch Steve; Alex Wolff, who previously collaborated with Byrne in the HBO program In Treatment was cast as the Grahams' son Peter. Cast in her cinema debut, 14 year-old Broadway theatre actress Milly Shapiro, winner of a Tony Honor for her performance in Matilda the Musical, earned the role of the pre-teen daughter Charlie. After watching Shapiro's audition, Aster was immediately relieved "'cause I knew the chances were slim that I would find somebody who would be right", having left Charlie's personality more ambiguous than other characters in the script. Ann Dowd portrays grieving mother Joan, who convinces Annie of her ability to contact the dead. The film began shooting in February 2017 in Utah. The exteriors of the Graham family house and the tree house were shot in Summit County, Utah, and the school scenes were shot at West High School and Utah State Fairpark, but all other interiors (including both versions of the treehouse) were built from scratch on a sound stage. Since each of the rooms was built on a stage, walls could be removed to shoot scenes at a much greater distance than a practical location would allow, creating the dollhouse aesthetic of the film. Hereditary premiered at the Sundance Film Festival on January 21, 2018. The trailer for the film was released on January 30, 2018. On Anzac Day in 2018, the trailer for Hereditary played before the PG-rated family film Peter Rabbit in a cinema in Innaloo, Western Australia. According to a report in The Sydney Morning Herald, the Hereditary preview was accidentally shown to family audiences and created a small panic in the theater. The theater was apparently full of families including "at least 40 children". The film was released in the United States by A24 on June 8, 2018. It was released in the United Kingdom by Entertainment Film Distributors on June 15, 2018. Hereditary has grossed $44 million in the United States and Canada, and $35.3 million in other countries, for a total worldwide gross of $79.3 million, against a production budget of $10 million. In the United States and Canada, Hereditary was released alongside Ocean's 8 and Hotel Artemis, and was originally projected to gross $5–9 million in its opening weekend, similar to the debuts of previous A24 horror films The Witch ($8.8 million in 2016) and It Comes at Night ($6 million in 2017). It was also the widest-ever release for an A24 film with 2,964 theaters, besting the 2,553 of It Comes at Night. After making $5.2 million on its first day, including $1.3 million from Thursday night previews, weekend estimates were increased to $12 million. It went on to debut to $13.6 million, finishing fourth at the box office, behind Ocean's 8, Solo: A Star Wars Story and Deadpool 2, and marking the best-ever opening for an A24 title. In its second weekend the film dropped just 49.5% to $6.9 million (compared to the 60–70% fall many horror films see in their sophomore frame), finishing sixth. By July 29, 2018 the film had grossed $79 million worldwide, passing Lady Bird ($78.5 million) to become A24's highest-grossing film worldwide. On Rotten Tomatoes, the film holds an approval rating of 89% based on 326 reviews, and an average rating of 8.2/10. The website's critical consensus reads, "Hereditary uses its classic setup as the framework for a harrowing, uncommonly unsettling horror film whose cold touch lingers long beyond the closing credits." On Metacritic, the film has a weighted average score of 87 out of 100, based on 49 critics, indicating "universal acclaim". Writing for Rolling Stone, Peter Travers gave the film 3.5 out of 4 stars and called it the scariest movie of 2018, saying "it's Collette, giving the performance of her career, who takes us inside Annie's breakdown in flesh and spirit and shatters what's left of our nerves. Her tour de force bristles with provocations that for sure will keep you up nights. But first, you'll scream your bloody head off." For The A.V. Club, A.A. Dowd gave the film an A−, stating that, "In its seriousness and hair-raising craftsmanship, Hereditary belongs to a proud genre lineage, a legacy that stretches back to the towering touchstones of American horror, unholy prestige-zeitgeist classics like The Exorcist and Rosemary's Baby. Remarkably, it's a first feature, the auspicious debut of writer-director Ari Aster, whose acclaimed, disturbing short films were all leading, like a tunnel into the underworld, to this bleak vision." Common Sense Media gave the film four out of five stars and advised that it was suitable for viewers aged 17 or older. Audiences polled by CinemaScore gave the film an average grade of "D+" on an A+ to F scale. Some publications noted the critics-to-audience discrepancy, comparing it to Drive, The Witch and It Comes at Night, all of which were critically acclaimed but failed to impress mainstream moviegoers. Conversely on Rotten Tomatoes, 64% of over 10,000 viewers liked the film, giving it an average score of 3.4 out of 5. ^ "Hereditary (2018) | BFI". BFI. Retrieved September 19, 2018. ^ a b c D'Alessandro, Anthony (June 10, 2018). "'Ocean's 8' Steals Franchise Record With $41.5M Opening – Early Sunday Update". Deadline Hollywood. Penske Business Media. Retrieved June 10, 2018. ^ a b "Hereditary (2018)". Box Office Mojo. Amazon. Retrieved August 25, 2018. ^ Means, Sean P. (December 19, 2017). "A horror thriller filmed in Utah is among the additions to 2018 Sundance Film Festival lineup". The Salt Lake Tribune. Retrieved January 25, 2018. ^ Guardian staff (January 30, 2018). "Hereditary trailer: will this be the year's scariest movie?". The Guardian. Guardian News and Media. Retrieved January 30, 2018. ^ Giles, Jeff (June 7, 2018). "Ocean's 8: Satisfying but Slight". Rotten Tomatoes. Fandango Media. Retrieved June 8, 2018. ^ Wloszczyna, Susan (June 7, 2018). "Writer/Director Ari Aster on his Terrifying Debut Hereditary". MPAA. Retrieved February 18, 2019. ^ Chen, Nick (June 12, 2018). "How Ari Aster made the best horror movie of 2018". Dazed. Retrieved December 21, 2018. ^ a b Bishop, Bryan (June 7, 2018). "HOW HEREDITARY DIRECTOR ARI ASTER BECAME AN UNLIKELY HORROR HERO". The Verge. Retrieved December 21, 2018. ^ Newby, Richard (September 6, 2018). "How Director Ari Aster Turned 'Hereditary' Into a Harrowing Cinematic Experience". The Hollywood Reporter. Retrieved December 23, 2018. ^ a b Stefansky, Emma (June 8, 2018). "That Horrific Hereditary Scene Is Director Ari Aster's Favorite". Vanity Fair. Retrieved December 23, 2018. ^ a b c Fear, David (June 12, 2018). "Hereditary': Inside the Making of a Modern Horror Classic". Rolling Stone. Retrieved December 23, 2018. ^ Ryan, Patrick (June 12, 2018). "Milly Shapiro wants to freak you out as that creepy kid in 'Hereditary'". USA Today. Retrieved December 23, 2018. ^ Aster, Ari; Hammond, Caleb (June 6, 2018). "How They Did It: Building Hereditary's Haunted Houses From Scratch Was First-Time Helmer Ari Aster's Living Nightmare". MovieMaker. Retrieved June 15, 2018. ^ "Hereditary". Sundance Film Festival. The Sundance Institute. Retrieved July 31, 2018. ^ a b Stolworthy, Jacob (March 20, 2018). "Hereditary: Horror film branded 'scariest in years' gets UK release date". The Independent. Retrieved April 12, 2018. ^ Evans, Greg (January 30, 2018). "'Hereditary' Trailer: First Look At Ari Aster's Horror Pic That Haunted Sundance". Deadline Hollywood. Penske Business Media. Retrieved May 9, 2018. ^ Allain-Petale, David (April 26, 2018). "Cover your eyes kids: Perth families shown horror flick trailer". The Sydney Morning Herald. Fairfax Media. Retrieved April 28, 2018. ^ Clift, Tom (April 27, 2018). "A Cinema Traumatised A Bunch Of Kids By Showing A Horror Trailer Before 'Peter Rabbit'". Junkee. Retrieved April 27, 2018. ^ Sharf, Zack (April 26, 2018). "Australian Movie Theater Plays 'Hereditary' Trailer Before 'Peter Rabbit,' Families Panic and Flee the Cinema". IndieWire. Penske Business Media. Retrieved April 28, 2018. ^ Fuster, Jeremy (June 6, 2018). "Can 'Ocean's 8' Steal a Huge Box Office Haul Like 'Ocean's Eleven' Did?". TheWrap. Retrieved June 7, 2018. ^ Rubin, Rebecca (June 6, 2018). "Box Office Preview: 'Ocean's 8' Places Bets on $35 Million Bow". Variety. Penske Business Media. Retrieved June 6, 2018. ^ D'Alessandro, Anthony (June 17, 2018). "'Incredibles 2' Even Stronger As Pixar Pic Soars To Amazing $181M – Early Sunday Update". Deadline Hollywood. Penske Business Media. Retrieved June 17, 2018. ^ Tartaglione, Nancy (July 26, 2018). "'Hereditary' Becomes A24's Highest-Grossing Pic Worldwide With $78M". Deadline Hollywood. Penske Business Media. Retrieved July 26, 2018. ^ "Hereditary (2018)". Rotten Tomatoes. Fandango Media. Retrieved March 4, 2019. ^ "Hereditary Reviews". Metacritic. CBS Interactive. Retrieved December 11, 2018. ^ Travers, Peter (June 5, 2018). "'Hereditary' Review: Family Horror Tale Is the Scariest Movie of 2018". Rolling Stone. Retrieved June 6, 2018. ^ Dowd, A.A. (June 6, 2018). "Family Is a Curse in the Harrowing, Deeply Frightening Hereditary". The A.V. Club. The Onion. Retrieved June 18, 2018. ^ Anderson, Jeffrey M. "Hereditary". Common Sense Media. Retrieved June 13, 2018. ^ Gleiberman, Owen (June 10, 2018). "How Did 'Hereditary' Get a D+ From CinemaScore? For the Crime of Being More Artful Than Sensational". Variety. Penske Business Media. Retrieved June 13, 2018. ^ Newby, Richard (June 10, 2018). "Why 'Hereditary' Is Dividing Audiences". The Hollywood Reporter. Prometheus Global Media. Retrieved June 13, 2018. ^ "Hereditary". Rotten Tomatoes. Retrieved March 4, 2019. ^ "2018 EDA Award Nominees". Alliance of Women Film Journalists. December 27, 2018. Retrieved December 27, 2018. ^ "2018 BFOCA Winners". BFOCA. December 27, 2018. Retrieved December 27, 2018. ^ "If Beale Street Could Talk Selected as Best Film". BSFC. December 29, 2018. Retrieved December 29, 2018. ^ "Roma named Best Picture by Chicago Film Critics Association". WordPress.com. December 7, 2018. Retrieved December 9, 2018. ^ "Critics' Choice Awards Nominations: 'The Favourite' Tops With 14, 'Black Panther' A Marvel, 'First Man' Rebounds; 'The Americans' Leads TV Series". Deadline Hollywood. Penske Media Corporation. December 11, 2018. ^ "'Eighth Grade' leads DFCS nomineess". The Detroit News. December 11, 2018. ^ Collis, Clark (January 22, 2019). "Halloween, Hereditary, and A Quiet Place nominated for Best Movie...at Fangoria Awards". Entertainment Weekly. Retrieved January 23, 2019. ^ Rife, Katie (January 22, 2019). "Screw the Oscars, let's see who got nominated for a Fangoria Chainsaw Award". The A.V. Club. Retrieved January 23, 2019. ^ Nordyke, Kimberly (May 31, 2018). "Golden Trailer Awards: 'Black Panther,' Netflix Top Winners List". Prometheus Global Media. ^ "Nominations Announced for the 28th Annual IFP Gotham Awards" (Press release). Independent Filmmaker Project. October 18, 2018. ^ "2018 Gotham Awards Nominations: 'The Favourite' and 'First Reformed' Lead the Pack" (Press release). IndieWire. October 18, 2018. ^ "34th Film Independent Spirits Nominations Announced" (PDF) (Press release). Los Angeles: Independent Spirit Awards. November 15, 2018. Archived (PDF) from the original on November 17, 2018. Retrieved November 17, 2018. ^ "Hereditary (2018): Awards". IMDb. Retrieved August 28, 2018. ^ Sheehan, Paul (December 9, 2018). "Los Angeles Film Critics Association Awards 2018: Full list of winners at LAFCA". GoldDerby. Retrieved December 9, 2018. ^ O'Keeffe, Christopher (June 21, 2018). "Neuchatel International Fantastic Film Festival Announces Full Lineup For 2018". ScreenAnarchy. Retrieved August 28, 2018. ^ "2018 StLFCA Annual Award Nominations". St. Louis Film Critics Association. December 9, 2018. Retrieved December 9, 2018. ^ "'Roma' Feels the Love with D.C. Film Critics". WAFCA. December 11, 2018.